There are, and always have been, three doors to Russia, every one of which has been jealously guarded first by Russian Czars and in the Communist era by Russian Czars posing as proletarian workers such as Josef Stalin. There is a Western point of access (Ukraine, Poland and the Baltic states), a Middle Eastern point of access (Afghanistan, Iran) and a Southern point of access (China). Access doors open both ways and, depending upon one’s point of view, President of Russia Vladimir Putin has now either opened or shut all the doors. It would be paradoxical, though never-the-less true, to say he has shut the doors by opening them. Mr. Putin was featured as Time magazine’s “Person of the Year” in 2007. That year, China’s leader Hu Jintao was featured as a runner up. “President Barack Obama was caught on camera on Monday assuring outgoing Russian President Dmitry Medvedev that he will have ‘more flexibility’ to deal with contentious issues like missile defense after the U.S. presidential election. Mr. Medvedev apparently relayed the message, which may have been re-interpreted by Mr. Putin as indicating that Mr. Obama was a weak and indecisive president. Proof of Mr. Obama’s weakness is strewn all over the world: There were no defense missile emplacements in Poland or any of the Baltic States; Mr. Obama’s “lead from behind” foreign policy in Libya and Syria had collapsed; the personal representative of the president of the United States, Libyan Ambassador Chris Stevens, was assassinated by armed militants associated with al-Qaida, a metastasizing group of terrorists that, the American public had been told during Mr. Obama’s second presidential campaign, had been decimated after Mr. Obama had cut short the video career of Osama bin Laden. For a moment there, it appeared that Mr. Obama had turned over his Middle East portfolio to the once and future Time magazine “Person of the Year,” Mr. Putin. And, of course, Mr. Putin was only too happy to lend a shoulder. Next year, one may expect to find Mr. Putin’s mug on the cover of Time once again. Consider Mr. Putin’s triumphs: Mr. Putin has both shut and opened the Middle Eastern access doors. He is providing help to Iran in the county’s march towards the acquisition of nuclear weapons. The western door opens to natural gas pipe lines running from Russia through an as yet partly dismembered Ukraine to Europe, which can ill afford an interruption in energy supplies. The United States might supply Europe with sufficient energy resources, but its President, convinced the country can run on fuel cells, has been dithering on the opening of a Canada supplied energy pipe line. Afghanistan, which occasionally has provided a route used by Islamic terrorists to strike at the heart of Russia, has been, since the Taliban chased Russia out of the country, operating under an American protectorate now crumbling everywhere in the world. So long as an American Cerberus guards the Afghan door to Russia, the Islamic threat to Putin will be considerably reduced. Most recently Mr. Putin and Chinese president Xi Jinping have struck what Charles Krauthammer has styled in a recent column “a spectacular energy deal — $400 billion of Siberian natural gas to be exported to China over 30 years." This last foreign policy gesture opens and closes the last of Russia’s doors. Mr. Krauthammer’s columns are not read in the White House by Mr. Obama, who appears to have settled comfortably into a position of unarmed neutrality. His is the kind of foreign policy that is to be expected from a president chronically unable to determine friends from enemies. Those who cannot read the times will be done in by them. 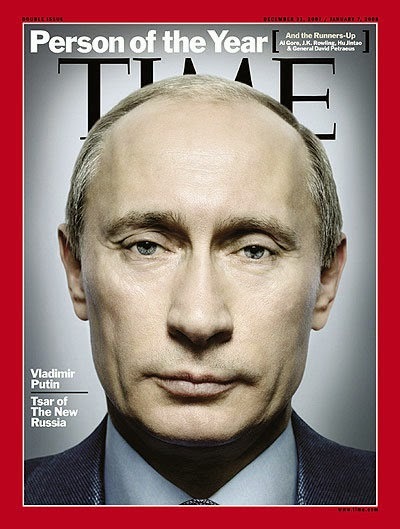 In any case, the second appearance of Putin as Time magazine's’ “Person of the Year” is imminent. His is the kind of foreign policy that is to be expected from a president chronically unable to determine friends from enemies. Those of us on the paleo-con side seek a foreign policy based in America's national interest. Not to say that no consideration should be given to "human rights," but the number one job of Obama and Kerry is to protect our country. But, what if Norman Podhoretz is correct, what if the American Left is essentially anti-American? Obama's own nationality, regardless of birthplace, is ambiguous in his own mind. Raised in American Polynesia and in Indonesia, "educated" in the Ivy League, and in attendance at the Church of the Not Very Reverend Wright he's not sure when dealing with other countries whose side he's on. Coupled with his gross incompetence and dishonesty (Putin is more credible), and we have a recipe for collapse of rational American involvement across the globe. We must pray that His Delinquency doesn't lead the world from behind into a major catastrophe.